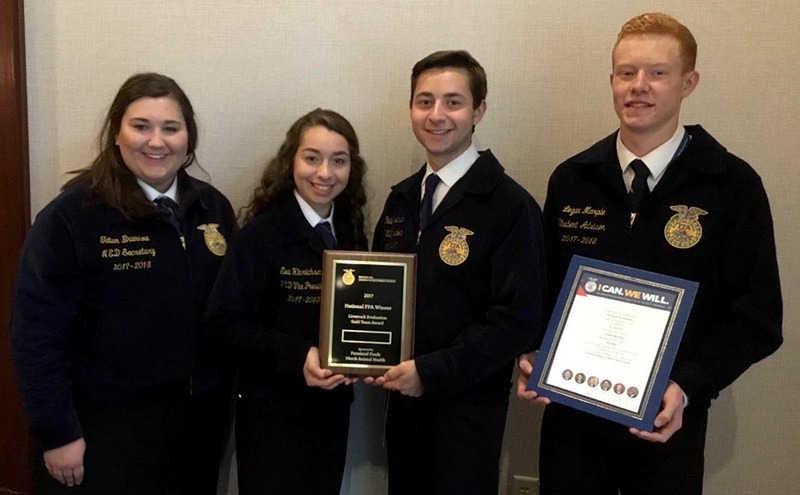 This year, the national FFA convention was held Oct. 25-28 in Indianapolis, Ind. The FFA chapter was able to go this year because the livestock judging team won state during the 2016-2017 school year. Last year’s team, graduate Cale Hinrichsen, seniors Tatum Brunkow and Logan Marple and junior Eva Hinrichsen, won state by 30 points. This huge lead allowed them to continue to the next level to compete for the national title. The national convention was home to more than 60,000 FFA members and sponsors. The livestock judging teams went a few days before the officer team to compete. Then, once the entire chapter was together, the days at convention were filled with keynote speakers, leadership activities, concerts and seminars. High expectations are being held for every member of the team. At state last year, Marple was the top-scoring individual, with Eva Hinrichsen following in second. Cale Hinrichsen and Brunkow helped the team with their scores as well. Every score counts as the team represents Kansas at nationals.